With less than 300 days before the start of the 2014 FIFA World Cup in Brazil, fans can now apply to buy tickets on the FIFA website, so to get you in the mood, we’ll be taking a look at the twelve stadium sites being prepared for the event, beginning with the Estádio do Maracanã. 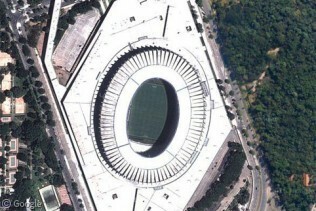 The Maracanã – the largest stadium in South America – was built as the main venue for the 1950 World Cup, with the host nation playing most of its matches here, including the stunning loss to Uruguay in the final game of the tournament1, for which an estimated 200,000 spectators crammed the stadium. For the upcoming event, including the final, it will hold a more modest 78,000, following an extensive construction project which saw the entire seating area and roof rebuilt. 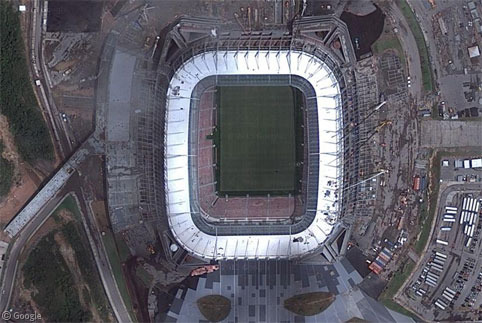 Although safety worries almost led to the cancellation of a recent friendly between England and Brazil at the Maracanã, and construction delays at many of the stadiums have given FIFA cause for concern, the recent Confederations Cup took place with few problems at the venue. However widespread protests across the country at the same time drew attention to public unrest. Initially related to transit fare increase, but quickly coming to reflect the widespread concern about the vast sums of money being spent on sporting events, which also include the 2016 summer Olympic Games. Brazil had to get special permission from FIFA to use twelve venues, because the organisation usually tries to limit it to 8-10 cities. 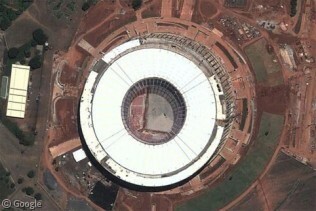 The nation’s capital Brasília has the second largest stadium, the Estádio Nacional Mané Garrincha. This new 71,000 seat venue replaces a building which stood on the site until 2010, which was also named for the famous Brazilian player. While we can see the mostly-finished structure on satellite view, when the Street View car went by, it was still under construction. The match to decide third and fourth places will be held here. Naturally Brazil will play in the tournament’s opening match, which will take place at the newly-constructed Arena Corinthians in São Paulo. 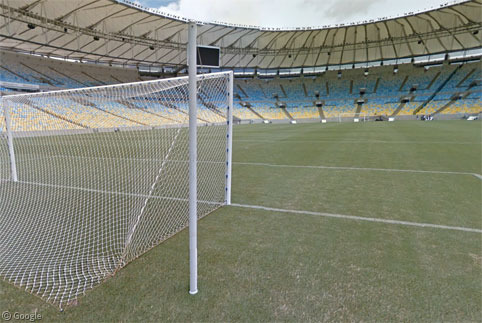 Named for the local club that will use it after the tournament is over, the stadium has an intended final capacity of 48,000, though temporary seating will bring it to over 67,000 for the duration of the World Cup. 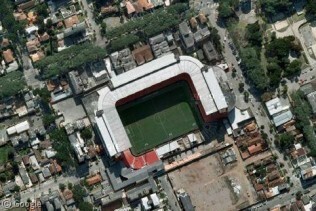 The larger Morumbi stadium was the organisers’ first choice for a venue in this city, but owners could not guarantee the funds needed for expansion and improvement. 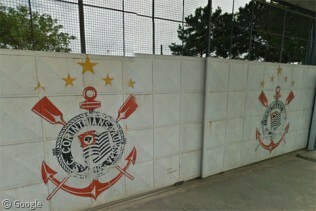 All we can see is the early stages of construction, though Street View shows us the Corinthians logo on the gate. We will look briefly at the other nine stadiums, of which four are existing buildings being upgraded, and five are brand new. The majority are in cities which are on or near the Atlantic coast. In the north-eastern part of the country, three cities relatively close together will all be part of the tournament. 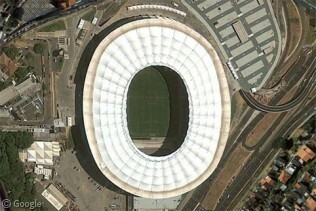 In Fortaleza, the renovated Castelão will hold 66,700 spectators. 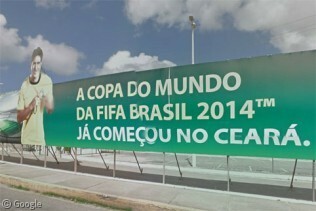 While the renovated stadium gleams in the sun on the satellite view, Street View shows us only billboards advertising the World Cup. 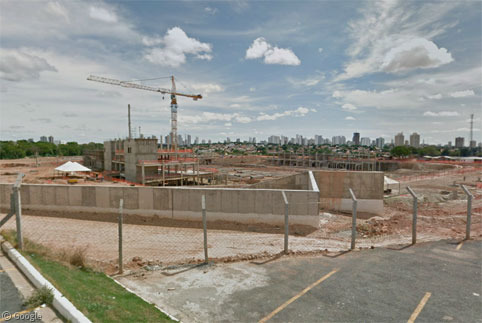 In Natal, we can see the 45,000 seat Arena Das Dunas, which is partially completed in both views. And in Recife, the 46,000 capacity Itaipava Arena Pernambuco will receive energy from a solar power plant which is being built in a bid to develop green energy in the area, and which will supply local houses when the stadium is not in use. Continuing along the Atlantic coast to the south-west, Salvador’s Itaipava Arena Fonte Nova will hold around 55,000 fans. The Arena da Baixada in Curitiba will be 100 years old next year, so it’s only fitting that it should hold some of the early round games, for which it has been expanded to seat 44,000. Satellite and 45° imagery give us very different views of the process. 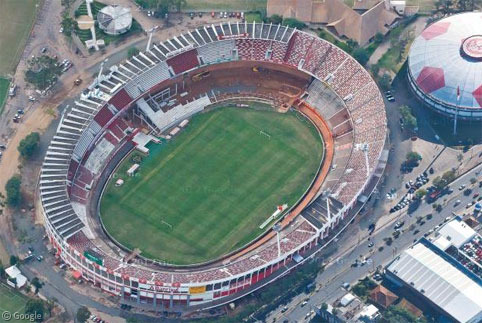 As is the case with many older stadiums, it is in the middle of a densely-populated neighbourhood, whereas many of the newer venues are built in suburbs to allow for large car parks and easy transit access. 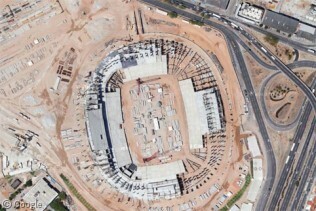 In Porto Alegre, the 44-year old Estádio Beira-Rio, shown in spectacular detail by the 45° imagery, is being updated and expanded to hold up to 62,000 spectators. 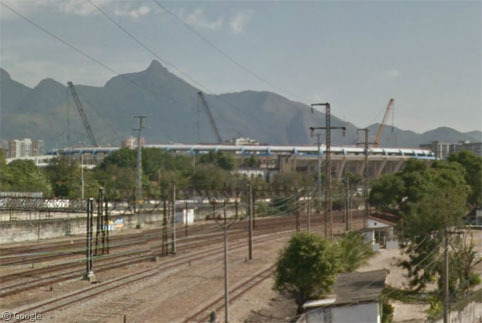 Moving inland, the Mineirão in Belo Horizonte will hold 62,500 people, though over 130,000 have squeezed in for matches in the past. Similarly beset by construction problems, in the far north of the country the 46,000 capacity Arena da Amazônia is the most remote stadium, with the city of Manaus being so isolated that it doesn’t even have Street View coverage! You can learn more about all these venues at the official World Cup site, and at Wikipedia. 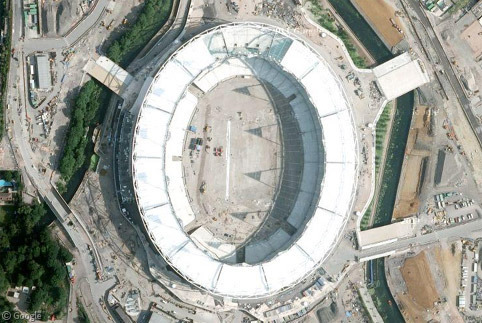 If Google updates their imagery before the World Cup we’ll do another post looking at the completed stadiums. 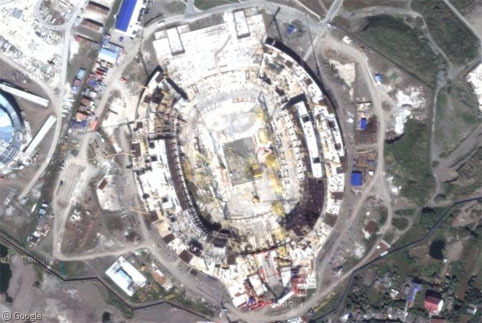 And with the summer Olympics happening two years later, we’ll be looking forward to imagery of those sports venues as well! Manaus (and lots of other places in the interior of Brazil and Colombia) is now on Street View! 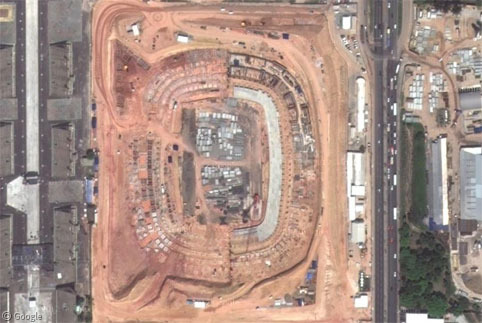 Here’s the Arena de Amazônia.